Et par kort med et av de herlige stemplene fra Gorjuss, som man kan få tak i på FunkyKits, UK. Det første kortet har jeg laget etter skissen til Sugar Bowl challengen #13 Sketch by Lilian. 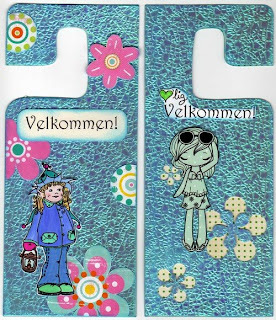 Two more cards made with one of the Gorjuss girls from FunkyKits! 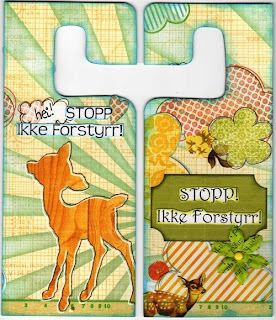 The top card is made after the The Sugar Bowl – Challenge 13 – Sketch by Lilian. 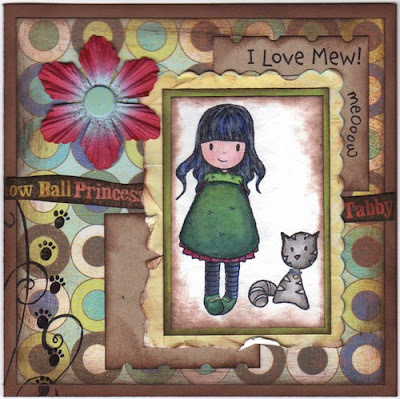 Stamps/Image: SugarNellie - Gorjuss - Purrfect Friend. Texts from Stampendous - Love my Cat, & Cats pajamas - Loving Mew. The bottom card txt reads something like: 'Good friends prolongs the smile'.. from Kreativ Hobby. Magnolia - BakgrundsSwirl Bröllup. Paper: Bazzill & Kraft cardstock. Basic Grey Skate Shoppe - pop-shuv-it, and a Noteworthy diecut journaling paper from M.M.Embellishments: On the bottom card I made a striped paper with lots of sticky glue & bazzill scraps, leftovers from cutting & scoring the card itself. Then using the Cuttlebug & one of the dies from Spellbinder Nestabilities Labels One I cut the frame. Flower is from Prima, brad unknown. 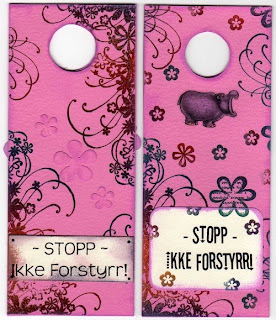 I paint my stamp-motifs with a mix of aquarelle paints, distress inks & H2O. Stamps/Image: Winter Elves - Illumination from Pollycraft Designs, & Shine - Anya stamp from the greeting Farm. And the Inque Boutique - Bella Flora mini set. Paper: Misc. scrapping papers. Bazzill, Sassafraslass - Fawnd of you. Dette kortet har jeg laget etter skissen til Sugar Bowl challengen #12 Sketch by Lia. Ble litt mørkt bilde i scanneren.. Jeg elsker disse nye stemplene fra Gorjuss - og gleder meg til neste pakke kommer fra FunkyKits :) I hope everyone is having a great summer!!! We sure are - right now we have a period with rain rain and more rain... but hopefully good weather will come again, and then we'll be off on a roadtrip up north. 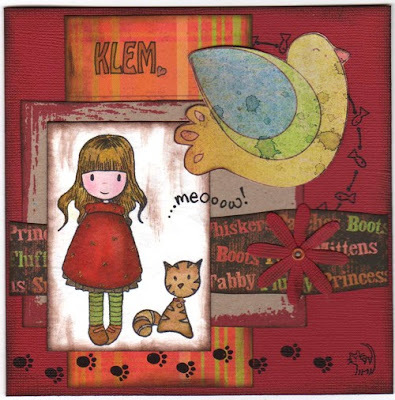 This card is for the The Sugar Bowl – Challenge 12 – Lia’s Sketch Love my new gorjuss stamps!!! And they look SO good in H2O & Distress ink! 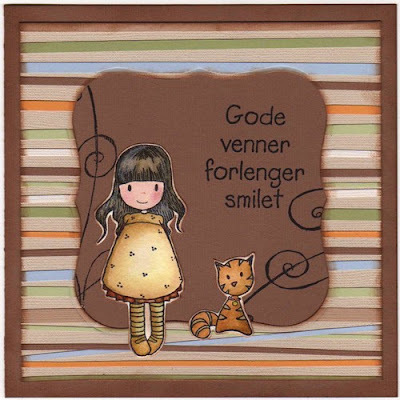 Stamps/Image: SugarNellie - Gorjuss - Purrfect Friend. Stampendous - Love my Cat. Lazar StudioWERX Inc. 'photo' frame stamp. 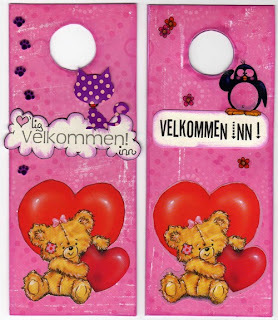 And the text 'Klem' (=Hug) is taken partial from a Kreativ Hobby stamp. Paper: Bazzill. DCWV - The Pets Premium Paper Stack. The birdie is cut out of Fancy Pants - Sweet Spring - Madelon. Embellishments: Eyelet & QK-shape Daisy RS-0376.